eCite - Will the Russians abandon Mirny to the penguins after 1959... or will they stay? Will the Russians abandon Mirny to the penguins after 1959... or will they stay? 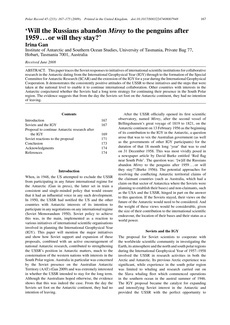 This paper traces the Soviet responses to initiatives of international scientific institutions for collaborative research in the Antarctic dating from the International Geophysical Year (IGY) through to the formation of the Special Committee for Antarctic Research (SCAR) and the extension of the IGY for a year during the International Geophysical Cooperation. It demonstrates the consistently positive attitudes of the USSR to these initiatives and the steps that were taken at the national level to enable it to continue international collaboration. Other countries with interests in the Antarctic conjectured whether the Soviets had a long term strategy for continuing their presence in the South Polar region. The evidence suggests that from the day the Soviets set foot on the Antarctic continent, they had no intention of leaving.